Kia Track'ster revealed | What Car? The Kia Track'ster concept car has been unveiled at the Chicago motor show. Kia's two-seat concept model previews how a sporty three-door version of the Soul might look. Powered by a 247bhp 2.0-litre turbocharged petrol engine, the four-wheel-drive Track'ster's aggressive styling is designed to make it look like a bulldog, according to its chief designer, Tom Kearns. Its low ride height accentuates that muscular styling, as do large vented Brembo disc brakes. The concept car is also significantly longer and wider than the Soul. The wheelarches are filled by 19-inch alloys, while at the front there's a large lower air intake, edged by two round LED lights. The carbonfibre sideskirts incorporate functional rear-brake cooling ducts. Twin exhausts complete the Track'ster's sporty exterior styling. Inside, the driver and passenger get Inferno Orange suede racing seats - there are no rear seats - while Granite Grey leather is used to trim the steering wheel and door panels. There's also a touch-screen panel to control the entertainment, navigation and ventilation systems, plus an engine start/stop button. 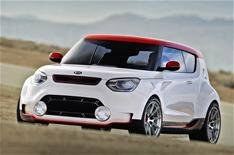 Kia has described the Track'ster concept car as the 'ultimate sporting representation' of the Soul. The three-door Track'ster could eventually be added to the Soul range alongside the five-door model and a convertible version that's currently under evaluation. There are no plans to put the Track'ster into production, but a US launch would make sense - more than 100,000 Souls were sold there in 2011.